The Tilbury Classic ocean swim is an exciting open water swim held over the Easter weekend in Nowra. Taking place at the beautiful Culburra Beach on the NSW south coast, the ocean swim is a fun event for more competitive open water swimmers. 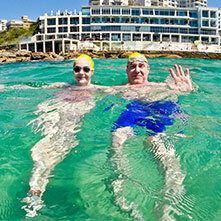 The 1.9km swim takes competitors around a stunning headland and through pristine ocean full of sea life and over reefs. The event is suited for more competitive open water swimmers and athletes as young as 13 years can take part. While in the area spend the weekend exploring the south coast town. There are plenty of beautiful picnic areas and walking tracks waiting to be explored. The Grotto Walk and Bomaderry Creek Walking Track are must-dos. The Tilbury Classic ocean swim is an exciting event held at the beautiful Culburra Beach. The 1.9km open water event starts at the scenic Tilbury Cove and makes its way around Penguin Head. The swim finishes at Warrain Beach in front of the Nowra-Culburra Surf Life Saving Club. The course is incredibly stunning taking swimmers through clear ocean filled with sea life and swells surging over reefs. The Classic is open to swimmers as young as 13 who obtain a Surf Rescue Certificate and have adequately trained for the event. While in town why not stay a couple of extra days to explore the Nowra area. The south coast town is full of beautiful beaches, bush walks and scenic picnic spots. Go and explore the Grotto Walk and Bomaderry Creek Walking Track or relax at the Bomaderry Creek picnic area. Bring your surf board and snorkels and enjoy the beach. Nowra is the perfect place to wind down, relax or explore. These small towns, and small swims, rarely have parking issues. This swim is no different.